One of the smallest chameleons of the world. Brookesia stumpffi, also known as the plated leaf chameleon, is a species of chameleon found in some parts of Madagascar. It can be found in Nosy Bé, north-west Madagascar, Nosy Komba, and Nosy Sakatia. Brookesia stumpffi was originally described by Oskar Boettger, a German zoologist, in 1894. The specific name, stumpffi, is in honor of Anton Stumpff, who collected the holotype. Glaw and Vences found B. stumpffi on small islands of Madagascar away from the main land mass of the country in 2007.The species can only be found in certain parts of Madagascar; it can be found in Nosy Be (sometimes known as Nosy Bé), north-western Madagascar, Nosy Komba, and Nosy Sakatia,and is common in the rainforest. 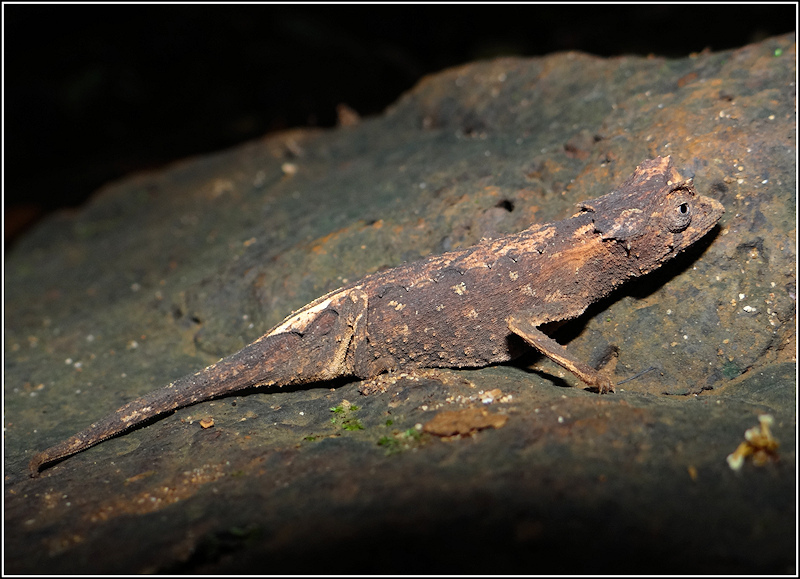 Brookesia stumpffi can be found up to a height of 150 metres (490 feet) above sea level, and can be found over an area of 61,884 kilometres (38,453 miles). There are no known major threats to the Brookesia stumpffi, and the species seems to be adaptable to "disturbed habitats".The species is sometimes kept as a pet and domesticated.The species is marked as Least Concern by the International Union for Conservation of Nature. Brookesia stumpffi can grow to a total length (including tail) of up to 9 cm (3.5 in), and has a life expectancy of at least three years. During reproduction, the female B. stumpffi lays between three and five eggs, which hatch between 60 and 70 days later, provided they are at a temperature of 23 °C (73 °F). B. stumpffi feeds on insects such as crickets, fruit flies, cockroaches, wax moths (waxworms), and grasshoppers. During the day, the body temperature of B. stumpffi is between 22 and 25 °C (72 and 77 °F), and is 20 °C (68 °F) during the night. Only registered TrekNature members may rate photo notes. Only registered TrekNature members may write critiques. You must be logged in to start a discussion. Just the visible eye makes this a habitat as the rest of it's body well comeoflage. Perfect lighting well exposed and composed. Este camaleón es novedoso para mi, y creo que para muchos. Tiene la apariencia de un objeto oxidado, lo cual seguramente es favorable para pasar desapercibido. Buena foto, bién expuesta y nítida. A peculiar reptile looking as if it were made from wood, Luciano. It is a sharp and clear picture, documenting this species that does not seem to be common. Amazing capture in a very difficult environment. Still colors and details are excellent in the low light. Interesting specie with his brown colors. Congratulation 🎊 🎊 🎊 🎊 🎊 🎊 for a new species again here in TN. Looks like rusted iron 😳. Well focus and exposure.